“Medicine for the Soul” was inspired by the increasing amount of people who are taking more and more pills for even the slightest reason. My antidote for needing to self-medicate is to make a gratitude list with at least 100 things on the list. 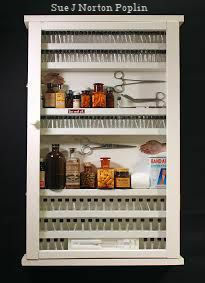 On the shelves of the medicine cabinet are found pill bottles, gauze, Band-Aids and other medical supplies. The 144 small vials each contain one thing I am grateful for. Gratitude is medicine for the soul.